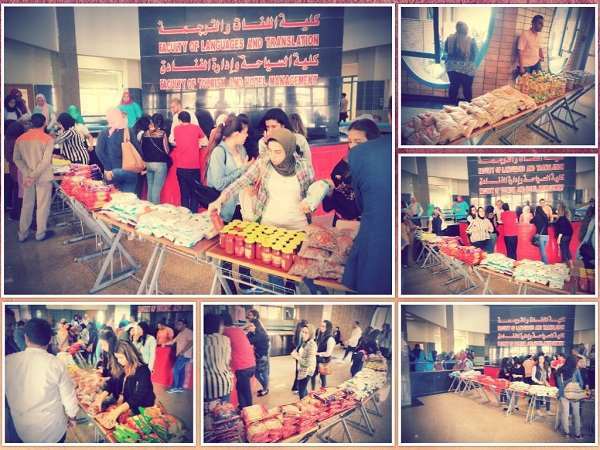 Under the supervision of the social committee, the faculty of Tourism and Hotel Management held its annual charity market on Tuesday 8/5/2018. A number of banners were especially designed to notify both students and faculty members of the charity market and encourage them to make donations whether in the form of used /unused clothes, food products or money. The charity market was opened by Prof. Ramadan Abu El-Ala, the Vice President of Community Service and Environment Development Affairs and Prof. Amani Refaat, the Dean of the faculty of Tourism and Hotel Management. This was held in the presence of faculty members, teaching assistants along with a substantial number of students. Customers of the charity market praised the quality of the clothes on sale and the prices of the food products. The market organizers promised to hold another charity market next year with a larger set of products.